Ba cheannaire ar Vítneam Theas é Ngô Đình Diệm (3 Eanáir 1901 – 2 Samhain 1963). Rugadh Diem do theaghlach Caitliceach Vítneamach in Quang Binh, i lár Vítneam. B'as ceantar Caitliceach den chathair Hué iad. Chuaigh a mhuintir leis an gCaitliceachas san 17ú haois. Bhí idir Laidin agus Sínis Chlasaiceach ag Diem de bharr an bhéim a chuir a athair ar an oideachas. I mí Dheireadh Fómhair na bliana 1955 agus i ndiaidh reifreann a rigleáladh go trom, chuir Diem Bao Dai as oifig agus chuir sé chéad Phoblacht Vítneam (RVN) ar bun len é féin mar uachtarán. 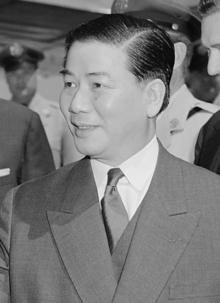 I mí na Samhna, 1963, i ndiaidh agóidí reiligiúnda agus frithbheartaíocht neamhfhoiréigeantacha, d'fheallmharaigh Nguyen Van Nhung, ofigeach in Arm Phoblacht Vítneam (ARVN), Diem, in éineacht le dearthár Diem, Ngo Dinh Nhu. Déantar díospóireacht i gcónaí faoi ról na Stát Aontaithe sna heachtraí seo chomh maith le nádúr Diem agus a cheannasaíochta . Tugadh an leathanach seo cothrom le dáta an 4 Iúil 2016 ag 06:05.